Remind her of how special and dear to you she is with this 12K rose gold & silver rose of Sharon necklace from Apples of Gold Jewelry. The Rose of Sharon, which is found in The Song of Solomon, is a flower that the King himself holds dear to him. This beautiful necklace, complete with 18 inch chain, measures 24mm in width and 37mm in length. The cross pendant is made from .925 sterling silver and features a beautiful 12K rose gold rose, creating a completely unique design. "Song of Solomon 2:1 - I am the rose of Sharon, and the lily of the valleys." 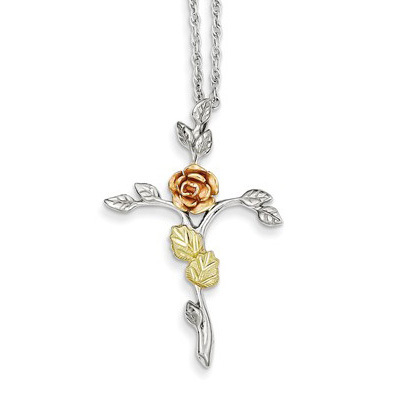 We guarantee our 12K Rose Gold & Silver Rose of Sharon Necklace to be high quality, authentic jewelry, as described above.